Fatigued to Fantastic!™ Daily Energy B Complex / 120 Veg Caps - Nature's Way®. If you're under stress, your body uses up B vitamins more rapidly. Plus, because B-vitamins are water soluble, they must be replenished every day for the body to operate with peak energy. * That makes it more important than ever to find the strongest support you can. 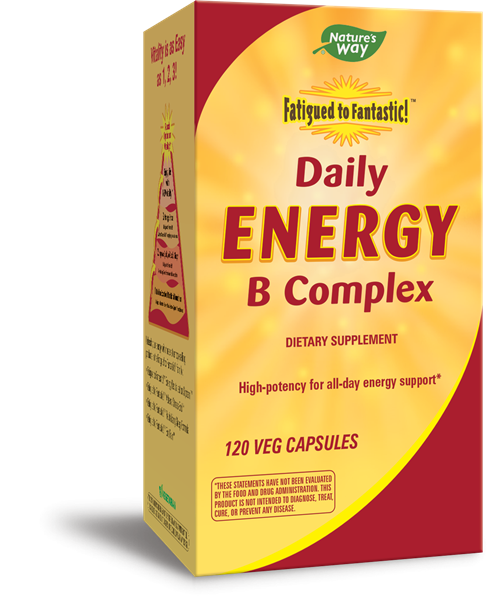 Why use Fatigued to Fantastic!™ Daily Energy B Complex? Take 1 capsule daily. Do not exceed recommended dosage unless advised by a healthcare professional. If pregnant, nursing, or taking any medications, consult a healthcare professional before use. Why does Fatigued to Fantastic! Daily Energy B Complex contain such high levels of the B vitamins? The B vitamins are a group of eight individual vitamins, often referred to as the B-complex vitamins. Like a group of good friends, the B vitamins do their best work when they are all together. Because they are water soluble, these hard working vitamins must be replenished every day. Water-soluble vitamins taken in excess are not stored (and therefore do not build up to toxic levels) but are simply excreted in the urine.As with all of our Fatigued to Fantastic! supplements, Fatigued to Fantastic! Daily Energy B Complexwas formulated with Dr Jacob Teitelbaum, recognized energy expert and author of From Fatigued to Fantastic! He chose the levels of B vitamins in the Fatigued to Fantastic! Daily Energy B Complex through his experience in caring for people with fatigue related health concerns and from the latest research findings, including his own placebo-controlled clinical trials.